New Ranet HTML Pivot Table 5.7.150 is released and available for download. Simplifying Ranet integration into other applications, and providing better tools for developers. Here is the list of the main new features that we have introduced in this build. Ranet HTML Pivot Table 5.7.150 has a new intuitive design providing users with a better experience working with pivot tables. 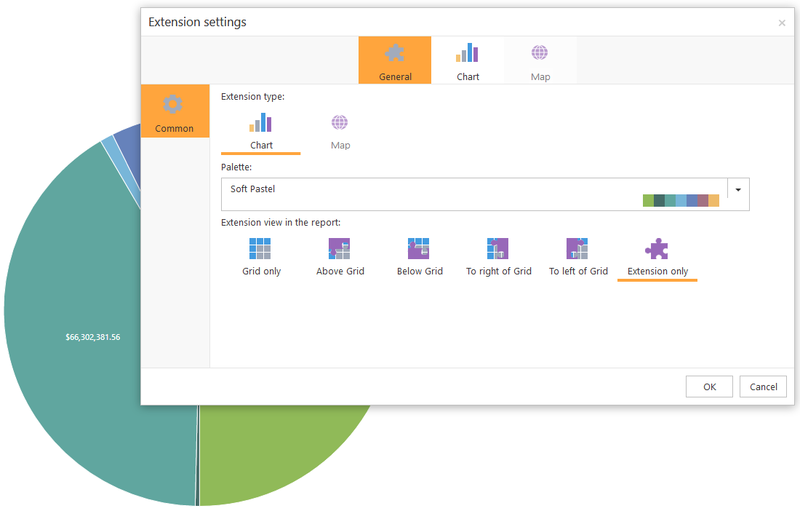 The new icons created according to the modern GUI trends make it easier to manage report, and the updated Toolbar helps users find the commands they need quicker and work more effectively. New Ranet version provides a better experience for users working with multi-page reports. 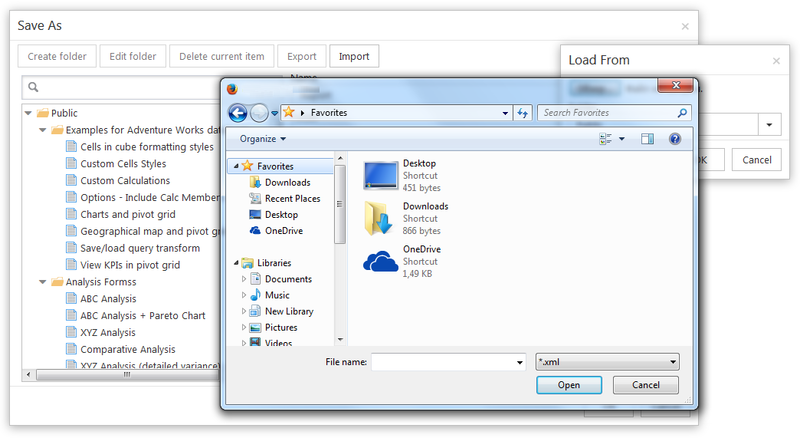 The bottom toolbar contains additional information and a menu to customize the pages and quickly switch between them. Ranet HTML Pivot Table has got an updated extension window, where users can set up the type, position, structure and other properties of the extensions they want to use for the report. Users can now include header and footer in the reports they create in Ranet HTML Pivot Table. The footer and header are exported to Excel with the rest of the report. There are several new features that extend possibilities for managing data in the pivot table. Such new features include pivot table data sorting option, cell context menu, and DrillThrough. Starting from version 5.7.150, users can apply sorting to the pivot table data using the context menu. The data in rows and columns can be sorted in descending or ascending order by property (caption, key) or context (using Measure). Read this post to learn more about sorting pivot table data in Ranet OLAP. 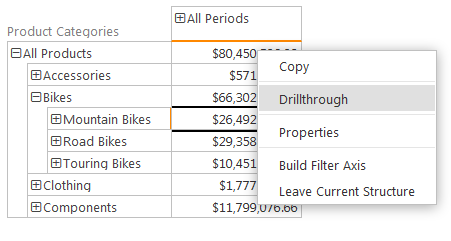 We have implemented a cell context menu allowing users to copy cells to the clipboard, view cell properties, apply DrillThrough operation, create a filter axis and filter the data in the pivot table based on the selected rows and columns. DrillThrough lets users search for and retrieve the data used to calculate the value of the cell to which it is applied. The result of the DrillThrough shows the cell’s value, its coordinates, and the table with detailed data. The result of the operation can be exported to Excel. 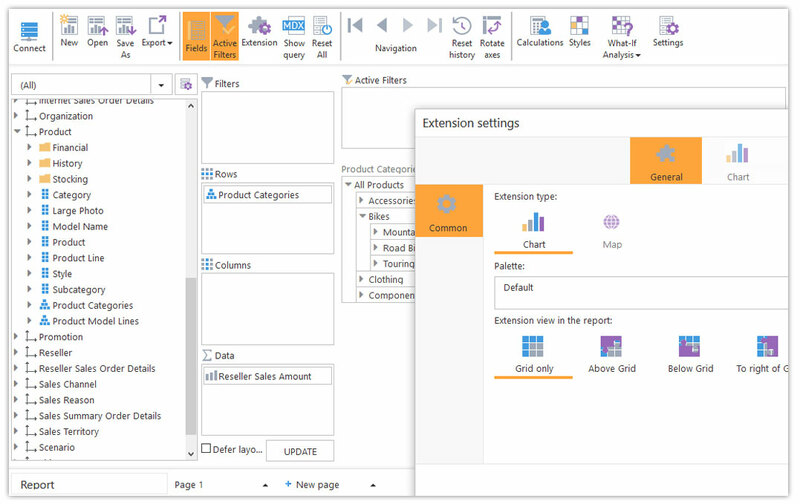 Read more about DrillThrough and cell context menu in Ranet OLAP. Ranet HTML Pivot Table has a new Member Choice filter, where users can select the cube members they want to see in the pivot table. The filter is applied to levels and has options to search members (in text and values) and view member properties. 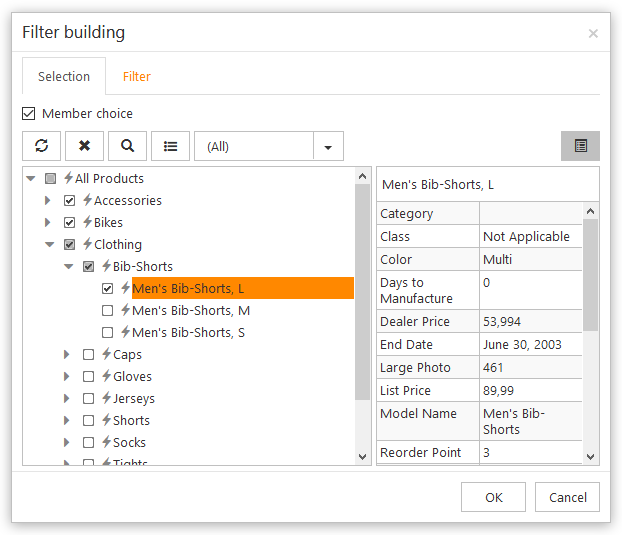 Read more about Member Choice and other pivot table filters in Ranet OLAP. We have added new options to export/import reports for end users. Ranet now allows exporting saved reports to a URL. The URL is generated automatically and can later be used to open the saved report in the browser. Users can also save reports on their computers as XML files, and open locally stored reports via the Saves As… – Import command. For this build, we focused on making the work with extensions more convenient to the user, as well as adding more options for visualizing the data in the pivot table. Users now have an option to use several charts (a table of charts) to visualize the data in the pivot table. The table view, i.e. the number of charts in rows and columns, is customizable. Users can create custom series or use auto-generated ones. 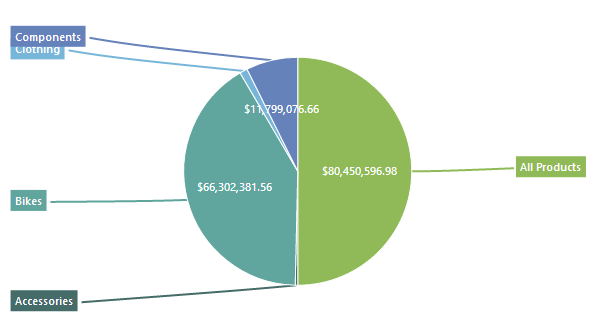 Users can now visualize their pivot table data on pie charts. 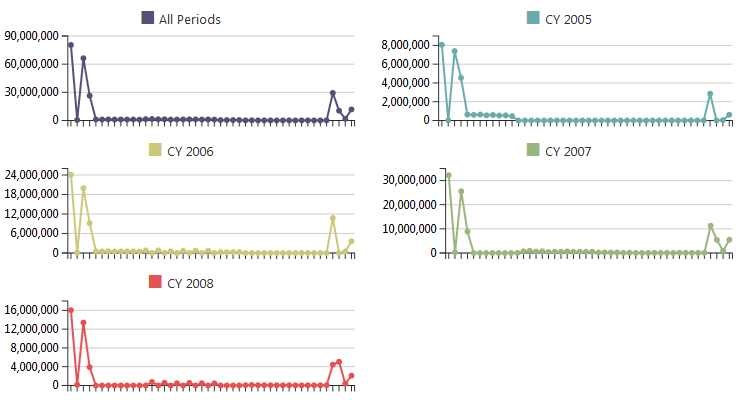 For this type of extension, the data is shown on several charts (a table of charts) by default. Users can create custom series. 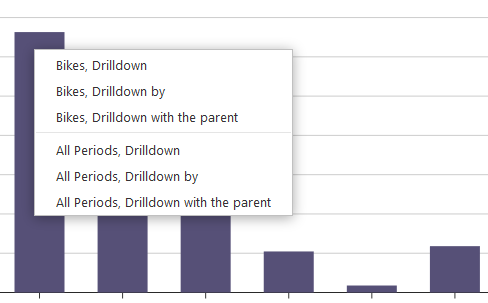 Pivot table charts now support several basic pivot table actions, such as Drill Down, Drill Down by…, and Drill Down with the parent. We have added XML comments to the frontend (Angular, JS) and server side code. The comments provide descriptions for classes and other objects and are aimed at helping developers that integrate Ranet pivot table for HTML into other solutions. Server logic virtual methods help developers provide a more seamless integration of Ranet pivot table into other applications. Download a free 30-day trial to try all new features in practice.